You want to prune your plants but you aren't sure how to do it. Plus, you do not want to jeopardize the health of the plant due to your lack of skill. Part of the challenge could be that you don't yet understand the difference between the two types of pruning cuts used when pruning and maintaining your plants. Both types of cuts can have a huge impact on how your plant grow, along with specific plant physiology, genetics, and environmental factors. In our DIY Garden Minute Ep. 51 - "Pruning Basics Explained: Thinning Cuts vs. Heading Cuts," we'll discuss the two different types of pruning cuts and how to perform each one. This episode is meant for any level of gardener who wants to learn how to better prune and maintain their yard. This is when you selectively cut single limbs or stems off a plant all the way back to its point of attachment. This doesn't necessarily mean the whole limb; maybe just a section or branch of the larger limb. Examples of this type of pruning are best for most trees, especially when creating "scaffolding" or branch structures. Creating space between the limbs can give a more even, balanced look to the tree or shrub and improve airflow inside the canopy along with more light penetrating to lower leaves. This is when you selectively cut limbs or stems not at their point of attachment nor near other growth points. This type of pruning is best for compact and dense growing plants which react well to shearing or hedging, other terms for "heading" cuts. Today's topic: "Pruning Basics Explained: Thinning Cuts vs. Heading Cuts"
You can also learn more by listening to our DIY Garden Minute Episode #10 about our 3-Pillars of Pruning. And don't forget to visit our Free Resources page to check out our plant profile sheets and printable freebies for mulching, pruning, and MORE! A link for both of these will be in this episodes show notes and on this episodes webpage. Also be sure to read our Winter Pruning post or listen to our Fall Pruning Do's and Don'ts podcast! 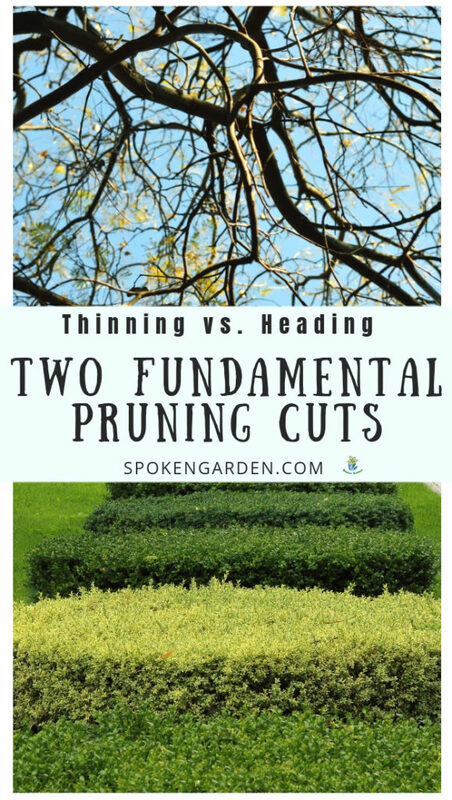 Click the graphic above to save "Pruning Cuts" to Pinterest for later! Learn about 2 different types of pruning cuts you can make on your trees, shrubs, and plants! The difference between heading cuts and thinning cuts. Examples for when to use each type of cut.